Was awake this morning before 6am. 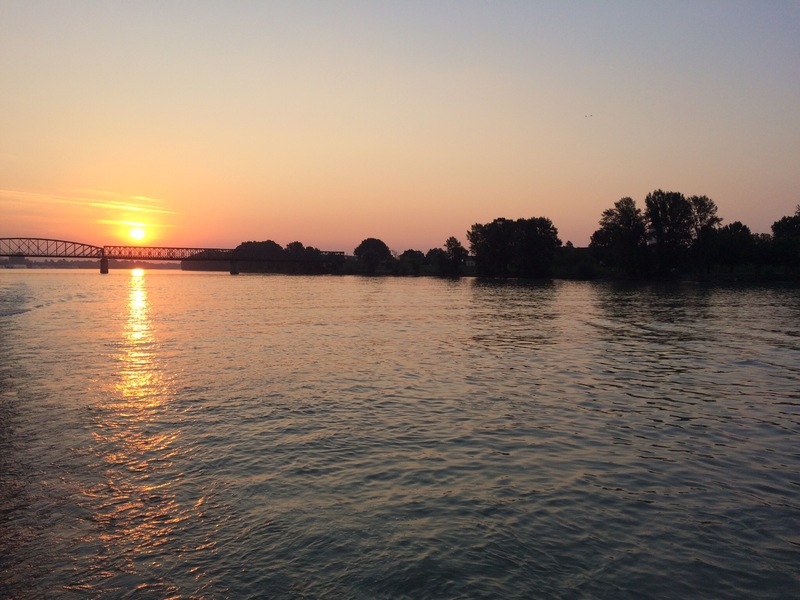 Took a peek out the window and witnessed a beautiful sunrise on the Danube. We were passing small villages and vineyards and in the distance on a hill was what I later learned was a monastery, one of several in the area. We docked at Durnstein. Steve and I headed out about 8, walking past well kept vineyards into a very neat and very old little village. Like most villages on the river, you have to go up to see the details so we headed up the hill past ancient doors, beautiful well tended flowers, and clean clean streets (no graffiti here – that is unusual in this part of the world). We passed or were passed by grandmothers riding their bikes with full baskets. We encountered a cute cat that stayed still long enough to take his picture. Durnstein actually is historically significant. Ruins of Burgruine Durnstein overlook the town. Here Richard I of England (Richard the Lion-hearted) was held captive by Leopoldo V, Duke of Austria during the Third Crusade. There was a monastery here as well as a convent. Though there are autos here, the primary mode of transport is bicycle. This is the place that you want to come back to and spend a week in a B&B, living among the locals, and absorbing the peacefulness of the area. I think this place stays on my bucket list, too.